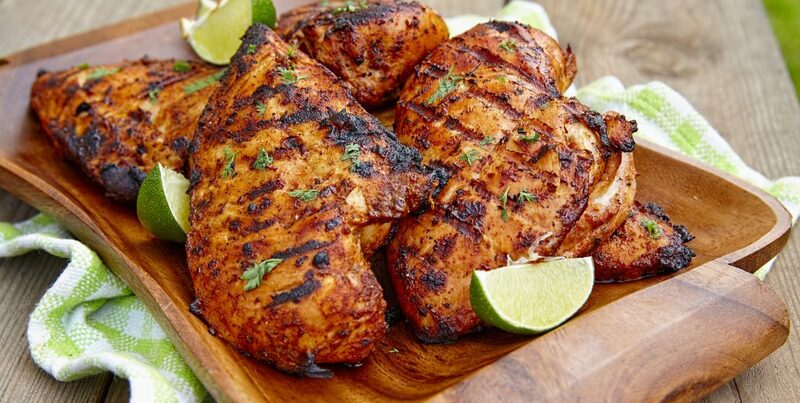 Perfect for a summer BBQ or simply cooked on the grill, we are loving this very special but very easy Summer Mojito chicken recipe.… pour another mojito love! The rum and sugar will caramelise well when cooked together in a marinade – do keep an eye on it as it cooks though and adjust the grill to get a nicely browned skin without too much blackening. You could also barbecue the chicken if you like. Serve with rice and a fresh green salad and sliced avocado. Zest and juice the limes into a bowl and add the sugar, rum and mint. Add the chicken and mix to ensure the chicken is fully covered. Cover with a lid or cling film. Marinate for at least 30 minutes or for up to 24 hours. Heat the grill (medium heat, or halfway down in the oven) or prep your BBQ. Lay the chicken on a grill rack set over a roasting tin and grill both sides until cooked right through. Approx 25 mins in total – depending on the size and thickness of your chicken. If cooking on the BBQ, keep the meat high or use a medium heat. You’ll need to make sure the chicken is cooked through without burning the outside of the chicken – the sugary marinade will char, but you don’t want it to burn. Baste the chicken with any remaining juices while cooking and ensure you cook well after each baste (do not use the raw juices after cooking the chicken). Serve with rice and a nice crisp green salad with avocado slices and a few wedges of lime. Check out our Mojito recipe too! Put the mint leaves and 2 of the lime wedges into a tall glass. Crush the mint and lime to release the mint oils and lime juice. Add 3 more lime wedges and the sugar, and crush again to release more lime juice and oils. (Do not strain the mixture). Pour the rum over the ice, and fill the glass with soda water.